If you know of publications that should be listed here, send details to me, the webmaster. "Poingdestre-Poindexter - A Norman Family", by John Poindexter Landers. Also known as "The Red Book" from the color of it's cover is the progenitor of modern-era books about the Poindexter family and considered by some genealogist's as the Poindexter Bible. Available in many historical libraries and some public libraries and can even be found in England and Jersey. This book serves as a starting point for those wanting to learn about the family history in Jersey and in America. A lot of research went into its writing in the 1970's by John Landers, who is educated in classic languages. However, the book was published by his cousin and many source citations were left out of the book. Today, some of the facts surrounding the immigrant George and his family are in question, so the PDA is seeking the author's original documentation. The book was published in 1977 by Robert Downs Poindexter, printed by Von Beckmann-Jones in Austin, Texas. Library of Congress Catalog Card Number 77-90527. Priscilla Poindexter had two cases of never-sold books for sale but sold out of them at the 2014 reunion in Williamsburg. Search on E-Bay and Amazon where used copies will be offered from time to time. "The Poindexter Pride" by Gladys Blake, Publisher New York ; London : D. Appleton & Company, 1929. Description 3 p. b., 230,  p. front. 20 cm. Located at Oxford University, Bodleian BOD Nuneham Library Holdings, Location Call Number 25612 e.9939. I have not seen this book, yet. It might be available in other libraries in America, please let me know if you find it here in the U.S.
"Are We Related To Charlemagne?" By Edward G. Pickett, 2003, not a book, but is research in a web page format available right here. "Caesarea - A Discourse of the Island of Jersey"
We have the first few chapters here for your reading enjoyment provided by Howard Poindexter. It gives us an idea of what life was like on Jersey in the latter 1600's. I understand the original can be found at the British Museum and a copy is in the library at the Société Jersiaise in St. Helier, Jersey. It is also available from Amazon (1889 reprint by the Societe). You can read the whole book online at Google Books. Other manuscripts by Jean Poingdestre in the 1600's, Jean was a half-Uncle of our immigrant, George. He served as Latin Secretary to Charles l and as Lt. Bailiff of Jersey. Jean wrote many papers, view a list of some of them. 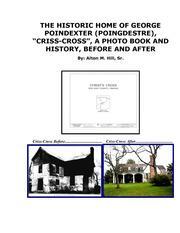 "The Historic Home of George Poindexter, Criss Cross, a Photo and History Book. Before and After" by Alton M. Hill Sr, 2008. Al published this book after researching records on the home built circa 1685 and talking with the owner. This is a photo, family history book about the first immigrant of the Poindexter (Poingdestre) family, George Poindexter (Poingdestre), and his colonial Virginia plantation home, Criss Cross, earlier known as Christ Cross, by the cross design. George Poindexter came to America from the Isle of Jersey, one of the British Channel Islands, off the coast of Normandy, France, and first settled in Middle Plantation, Virginia, now known as Williamsburg, in the 1650's. In 1680, he moved to New Kent, County, Virginia; in 1685, he and his wife, Susannah, began to build their plantation, Criss Cross, which was completed in 1690. Following George’s death in 1691, Susannah continued to live there until her death two years later. Then, their son, George II, continued to reside there. Criss Cross, left the Poindexter family in 1830, and has been out of the family since. By the 1950’s, it was almost completely deteriorated, when, in 1953, Ed and Gayla Harrison, saw the home, fell in love with it, realized its potential, and made a financial/time commitment to restore this home. In 1972, the Harrison’s made application to the U.S. Department of Interior to have Criss Cross placed on the Register of Historic Homes in America, and in 1973, the home was placed on the Register, and has been since that time. This book features old and new photos, as well as copies of original documents associated with this home, history, restoration and status today. Presently, this is the ONLY book written and published, in its entirety, about this Historic Poindexter Plantation Home, Criss Cross, formerly known as "Christ Cross". PDF version of this book is available here. A hard bound copy of this book may be purchased directly from the Poindexter Descendants Association for $40.00, plus $8.00 shipping & handling (US Dollars), by contacting Mr. Bob Poindexter at pondybj@dnet.net. Quantities are limited. Not in the book, but probably affected by the events of 1204, is the fact that the earliest record of Poingdestre in Jersey is 1309, but the name Poingdestre appears in Normandy in 1185 (more info). This book doesn't fill in the gap, but certainly helps us to understand what was happening and, who know, may help us genealogists to fill in the gap someday. Webmaster's Note: I was very lucky to schedule a holiday to Jersey when this book was released in May 2004. Professor Sir James Holt presented to an almost packed auditorium in St. Helier, discussing some of their research strategies and hurdles. He announced at the end that this was his final research project and presentation as he was retiring. It was a great experience for me. The Bailiff of Jersey was present, along with other Island VIPs, members of the Societe, Jersey Heritage Trust and the States of Jersey. I think the two of us were the only Americans in the audience. We did get to meet Sir James briefly afterwards and have him autograph our copies of the book. "Payne's Armorial of Jersey" published 1859 by J. Bertrand Payne. This publication includes information on the Poingdestre family as well as other predominant families of Jersey. It is available here as a PDF. More information is available on The Island Wiki. Our PDF and other formats are available from the Internet Archive. "Norman Pipe Rolls - Henry ll, 1180 and 1184 A.D." published by the Pipe Roll Society, London, 2004. On Page 5 in the Bayeux district (Basse Normandie or Lower Normandy), the pipe roll lists Ricardus Poindestre r.c. de x li. pro eodem. In thes. c s. Et debet c s.
See email from Dr. Everard for translation and background. This book ties in with "Jersey 1204" in that prior to King John loosing Normandy, our surname existed in Normandy. Ricardus owes a tax in this entry and again some years later. One time a wine tax and another time a fine for taking ell fish from the ocean which only the king could do. If he is paying a wine tax, did he have some land and cultivated grapes or run a winery? "All For the King - The Life story of Sir George Carteret (1609-1680)" by G.R.Balleine. This book is about Sir George Carteret of St. Ouen's Manor, Jersey. 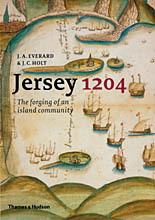 Much of the book covers the time of the English Civil War and how the Isle of Jersey was involved. He was about 20 years older than our immigrant, George Poingdestre, who himself nearing 20 years of age when the war started. So the reader gets a good idea of what life was like for many on the Isle that fought to preserve the Monarchy. Available to order online from the Société Jersiaise for £3.00 (about $5 US) and can be ordered online. I have read the book and highly recommend it for the history and what life was like during the 1600's in Jersey. Our immigrant George's half-Great Uncle Jean Poingdestre is mentioned in the book. Many other books and pamphlets are also available from the Societe. "Old Jersey Homes - Volume 2" by Joan Stevens, Publisher Phillimore & Co., London in 1977. The book was available from Société Jersiaise for £9.99 but wasn't there at my last visit in 2013. Volume 2, Page 128 discusses "Grainville", the home built by the main Poingdestre family when they moved from Swan Farm in the early 18th Century (well after our immigrant George came to America). Grainville is also mentioned in Poingdestre-Poindexter, A Norman Family listed above which also has a photo. A 1849 map reference is available on RootsWeb. Volume 1 (out of print) discusses Swan Farm, the manor that George would have grown up in, being a son of the Seigneur of the Fief es Poingdestre. "Roman du Rou", Maistre Wace, translated from the original by Glyn Burgess, published by Société Jersiaise 2002. Wace chronicles the first Dukes of Normandy and the first Norman kings of England through 1106 and the reign of Henry ll, Wace's benefactor. I have read this book and recommend it for those interested in reading about these early Normans from a decidedly Norman point of view. Keep in mind that even today, we can "buy" a published genealogy from publishers that include our own research or our own misinformation. Wace was being paid by Henry ll to write Henry's genealogy. Also, there is agreement by some historians that could indicate the Poindexter's are descended from these early Dukes. "The Parish Church of St Saviour", by F de L Bois, 1976. A history of the Church that the Poindestre family considered its home church. Compiled from authentic records, photos, plans and acient documents. Pages 66-68 are of particular interest to the PDA. These pages cover the period before and during our immigrants, George, childhood and the marriage of his father to his mother. Nicholas Effard is Rector, it his his daughter Elizabeth that marries George's father, Thomas. Another Thomas, George's Great Half-Uncle, that followed Nicholas Effard as Rector. It was during Nicolas and Thomas' Rectorship that many marriages and deaths were not recorded. This being the time period where our immigrant may have gotten married. This could be why we can't positively identify George's wife. Available from the Société Jersiaise and at the church (should you visit Jersey).